The genocidal Bosnian war of the nineties has faded from Western consciousness. Not many people remember the brutal days when Sarajevo had to hang a curtain so snipers could not target civilian pedestrians, although anyone who was paying attention then remembers the pictures of those who didn’t escape, lying in the streets. The memory has faded along with the physical damage, and the region has once again become a tourist magnet. 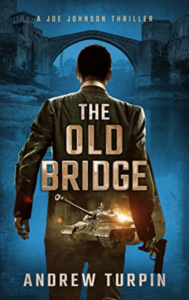 But as Andrew Turpin knows very well and demonstrates clearly in his second Joe Johnson thriller, The Old Bridge, the horrors of that war and the fratricide that accompanied it are still a dark presence. The continuing war crimes prosecutions in The Hague remind us of that whenever they appear on the front pages. Turpin’s hero is Joe Johnson, a capable former CIA agent who ran afoul of his superiors and turned to freelance war-crimes investigations. This book tells of a dossier dating to the war that was thought to have been destroyed, but maybe wasn’t. If it’s found it will cause acute embarrassment in high governmental circles of the United States. On the way to a very satisfactory resolution he takes us on visits to interesting places and introduces a compelling cast of characters. Other reviewers have dealt nicely with the plot. Like Turpin’s first thriller, The Last Nazi, this story moves at a fast clip. The interaction between characters is good. I read it in one session and look forward to finding time to read his third, Bandit Country. Another resource: Turpin wrote a detailed and fascinating summary of the background to The Old Bridge as part of his email list recently. I suggest you read it. It will provide a richer background to the story he tells in the book. You can find it here. 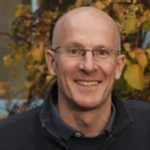 Andrew Turpin is a British writer who worked for many years as a business and financial journalist before becoming a corporate and financial communications adviser with several large energy companies, specializing in media relations. Amazon recently selected my first novel, Treasure of Saint-Lazare, for Kindle Prime Reading, which it calls a program “for its most engaged readers.” As a result, the book has vaulted upward in the sales rankings and landed firmly on several best-seller lists, the most prominent of which was the Action and Adventure list, where it reached #9. It reached #2,000 among all paid Kindle books, the highest since it was first published in late 2012 (there are about two million ranked books. so that made me very happy indeed). The third in my Eddie Grant series of Paris thrillers will be available in coming months. It’s not formally named yet, but it will be in my editor’s hands in a couple of weeks. Once again you’ll meet Eddie Grant, his beautiful wife Aurélie Cabillaud, their friends, Paris, and two new characters, both marine engineers in Miami who find themselves in Paris after a very narrow escape when their sailboat is bombed in Biscayne Bay. Part of the action is set in Miami, much in Paris, and part in the caves of Hungary. There are politics, romantic walks through Paris, and the usual amount of romance. If you’d like to join the Readers’ Group to learn when it will be available, or volunteer to be an early reader/reviewer, please click this link or the one in the box below. I’d be pleased to have you on the list, and you can unsubscribe any time. I invite you to follow my blog, Part-Time Parisian. There, I post reviews like this one talk about my books, plus whatever other shiny bauble attracts my attention.